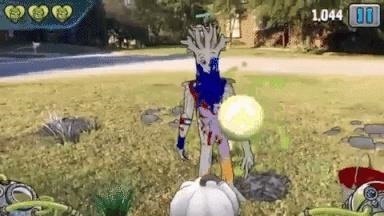 So, it's Halloween time, and you feel like playing around with some augmented reality apps? Well, you've come to the right place — if you have an iOS device. 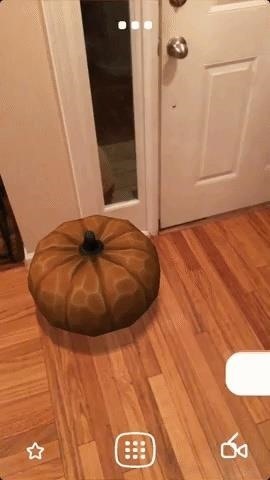 Sure, you could load up some Halloween-themed filters on Snapchat (like the new lens sponsored by Stranger Things 2) and call it a night, but luckily ARKit app developers remember Halloween as well. 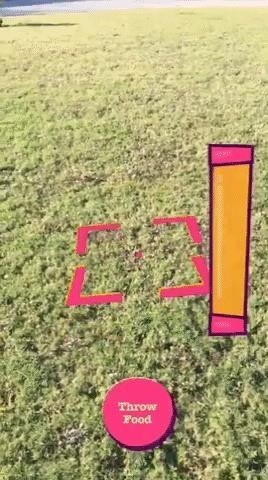 We've unearthed a few ARKit app treats that deliver some pretty cool AR tricks for your iPad or iPhone. We've covered this bloodless first-person shooter a few times now, both in its Tango and ARKit incarnations, but until now, we haven't taken the opportunity to do a hands-on with it. 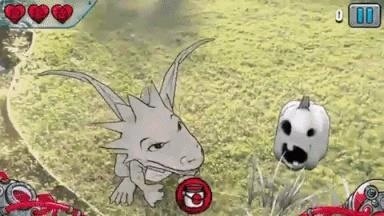 Just in time for Halloween, HitPoint has resurrected the Paint My Dragon story mode (which first appeared on the Google Play Store version) as a $1.99 in-app purchase for the iOS App Store edition. With the purchase, players also receive the Spooky Creatures pack, which adds 11 creepy characters to the arcade mode; players can opt to purchase just this pack for $0.99. While I only played the arcade mode, I had a lot of fun with this one. Instead of firing bullets, you shoot paintballs at various black and white creatures, who act like zombies until you color them. Some require more than one paint color, which players acquire via drops along the way. Firing is accomplished via screen touches, and I found that some adversaries required rapid fire to take down. The action is fairly hectic. so I'd recommend playing in a bigger, open room or outdoors. While the design skews toward a younger crowd, the gameplay is challenging and entertaining enough to merit a download to see if you like it enough to invest in the expansion packs. If you need a more gruesome FPS, try ARZombi. If you're a fan of churning out silly selfies with Snapchat's filters or making yourself into a Bitmoji, then this app is for you. If you aren't, this app may convert you. 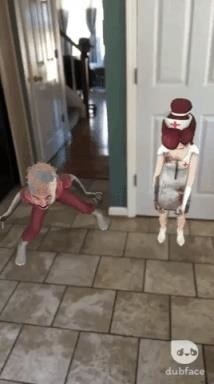 Dubface gives you the power to clip faces via your camera or photo gallery and paste them onto AR animations. You can place multiple caricatures, along with set dressings, into a scene that you can then capture in photos and video and share. I was sold when I got to make a zombie version of myself dancing along with Krysten Ritter as an evil nurse. 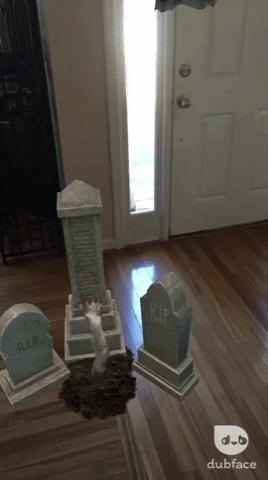 This app should be a hit at Halloween parties over the next few days. I originally thought Housecraft was like IKEA Place, but without the purchasing element. But then I saw the pumpkin, so I figured it might fit in this round-up. 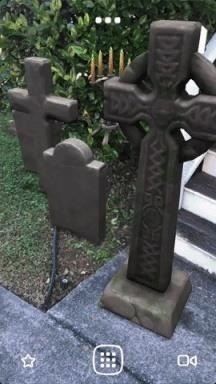 The mechanics are well-executed, allowing for flexibility in placement of objects around your home. You can record your screen as you place the items, which could be especially helpful in setting up virtual 360 design mock-ups. Housecraft's Halloween update is a sweet shortcut for people looking to trick others into thinking they've actually decorated their home for the occasion. For Halloween fun, you'll probably just want to flip back to Dubface, though. If you're like me, you believe that pigeons are rats with wings, and they should be scared off when the opportunity presents itself. With Pigeon Panic AR, you can practice your craft. The premise is simple: scatter bird food to attract pigeons, then scare them all away within the allotted time. 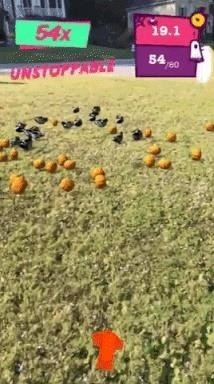 For Halloween, pumpkins serve as bait. The developer's description is right on the money; this game is ridiculous. It's also pretty hilarious. I'm sure I looked both weird and funny to passing drivers as I tilted at imaginary flocks of birds.